Because sauerkraut is made using a process called lacto-fermentation, it contains healthy bacteria which not only preserves the sauerkraut but is also beneficial for your own internal health. It’s naturally cholesterol free, fat free and high in vitamin C.
Making sauerkraut is super easy to make. All you need to find is a proper sauerkraut crock (available online). 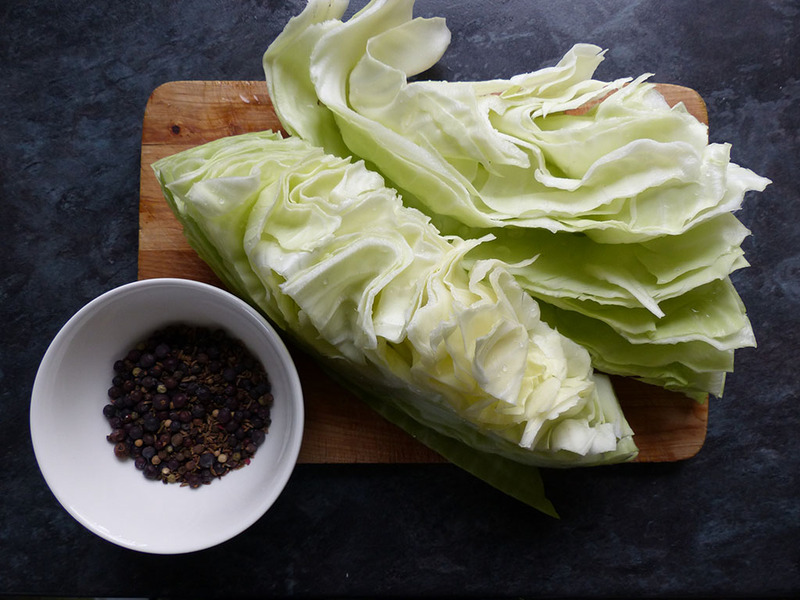 Then all you have to do is wash a white cabbage, shred it as thinly as you can (a kitchen machine is ideal, but can be done by hand), layer the sliced cabbage with a little bit of salt and juniper berries or caraway seeds in the crock. Pound it with your fists or something heavy (and clean) until there is a layer of water covering the cabbage. Leave it in a warm place to ferment for around 2 months. Then move it to a cooler environment. After about 2 – 3 months the sauerkraut should be ready to eat. Don’t worry if there is a layer of white mould floating on top, this is not toxic and can just be removed to eat the delicious sauerkraut underneath. Sauerkraut stores for a long time in a cool place. I still eat it in February/March!